Using BALANS you can describe the projectile and tube with up to 50 lumped mass nodes and connecting beams each, compute the deflection of the projectile and gun tube during movement of the projectile from breech to muzzle exit and determine the balloting contribution to dispersion. 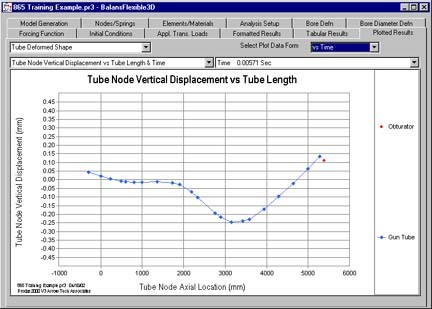 BALANS analyzes the dynamic response and interaction of a statistically representative, flexible projectile and a flexible gun tube during in-bore travel using a time step iterative solution. 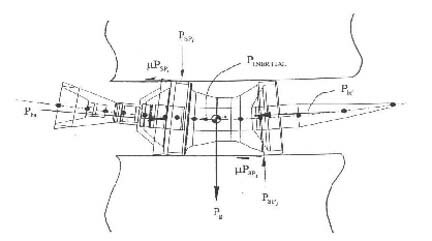 BALANS assumes the projectile is initially misaligned in the gun tube due to manufacturing tolerances. During firing, this misalignment produces secondary forces causing transverse displacement and yawing motion of the projectile as it travels from breech to muzzle. The resulting yaw angle and angular rate at muzzle exit are then analyzed for their effect on dispersion.